UPDATE: TechRadar just spoke with Motus' CEO who confirmed for us that this is NOT an official, first-party Microsoft device. 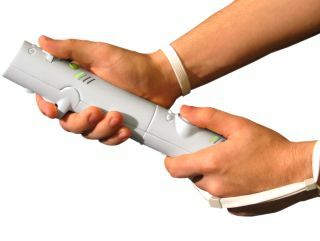 Motus is developing a break-apart motion controller for the Xbox, with three new video demos showing off the technology in use with popular Xbox 360 titles, Harry Potter, Tiger Woods Golf and Lego Star Wars. TechRadar spoke with a Motus rep today and we expect to find out more about this exciting new technology very soon. "Darwin uses a number of sensors that allow it to know where it is… It is self-contained, meaning what you hold is all you need, no IR strips or other devices for a reference point." Darwin also allows for "three modes of play: combined, two free hands or two player". Motus also provides a comprehensive guide to how and why its technology is more advanced than Nintendo's Wii Remote. Let's not beat about the bush then!